Multiclavula corynoides (one of the club-mushroom "lichens") on a mossy embankment, Ruby Mountains, eastern Oregon. The fungi in most lichens are members of a group called the cup fungi (Ascomycotina), whose fruiting bodies are usually cup-shaped (or disc-shaped in lichens), but a few fungi in the group Basidiomycotina, which includes club fungi and mushrooms, form associations with algae. (Some lichenologists don't consider these to be true lichens.) 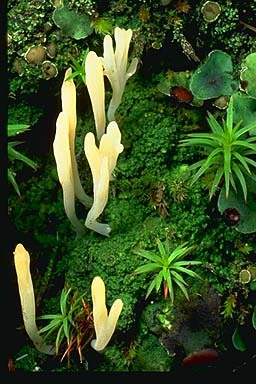 Their fruiting bodies are little mushrooms or little "clubs", and the lumpy green mass at their base is the body of the lichen.